When I was a kid, this was simply referred to as "Good Soup" It was my ultimate favorite. Rereading it now, I see that there's no indication of what happens to the meat from the pork neckbones. Basically, that ends up as a snack - or a lunch - for the cook. Cooked until falling-apart tender, it's great with barbecue sauce. Where it says, "adjust seasonings to taste," we generally preferred a tart tomato soup, and mom would often add sour salt or a little more vinegar to the soup if the canned tomatoes weren't tart enough. On the rare occasions when it was too tart, she might add a touch of sugar. And of course, salt had to be adjusted. I've made this using canned evaporated milk instead of cream for a version with less fat, and it's still good. You can also use store-bought noodles, but do try to find the kluski if you can. It's just not the same with regular noodles. I've also made a vegetarian version, using water instead of pork stock, and it's still fine. Or chicken stock works, as well. Of all the soups my mother made, this was the only one that used pork, and the only cut of meat she ever used was pork neckbones. You could substitute other cuts, if you prefer. After all, the meat doesn't go into the soup. Double-click on the image for a larger (and clearer) view. I thought the hand-written version had some charm, though. Simmer pork neck bones in water to cover in crockpot on low overnight. Remove bones, skim, and strain. Place broth in large pot, add 1 onion, chopped, and a couple of carrots, sliced. Bring to a simmer. Add salt (to taste) 1 lg. can tomato puree, and a splash of vinegar. Simmer until carrots are done. (Note: Whole, peeled tomatoes may be added halfway through cooking time, if desired.) Adjust seasonings to taste. Remove from heat and allow to cool slightly. Add milk or cream, stirring constantly. (If soup is too hot at this point, milk will curdle.) Serve with Kluski [noodles]. Mound flour (about 2 cups) in center of board. Make well in center. Drop in 1 teaspoon salt and 2 eggs. Stir eggs, breaking yolks and incorporating the flour a little at a time until the liquid is absorbed and you have a thick dough. Knead briefly, then roll thin and slice into strips about 1/4 inch thick. Let it dry slightly before boiling in salted water. 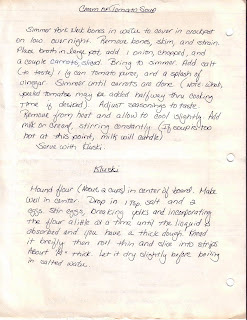 Could you type this recipe out? I can't read it. I wrote it out. Have fun!